How lululemon athletica stands to gain from a denim fallout. lululemon athletica (NASDAQ:LULU) may finally catch a break thanks to an emerging trend that's seeing teens and women everywhere swap their jeans for stylized yoga pants like those made by lululemon. Instead of loading up on new jeans, people are spending more money on what's being called "athleisure wear" or high-end yoga pants from lululemon and other fitness apparel makers, according to a recent interview with the CEO of Levi's Jeans. Sales of denim jeans are down 6% year over year, and those declines could get steeper as lululemon and other form-fitting garment makers such as Spanx rush new product offerings to market. But what's the big draw for consumers? Aside from the obvious comfort factor, leggings and yoga pants have undergone a makeover recently, and shoppers like what they see. The yoga apparel maker amps up its style with eye-catching patterns. Source: lululemon athletica. lululemon is getting back to its innovative roots with a new fall product line that's anything but ordinary. Products such as four-way stretch pants in trendy prints and Lab Night Tights, pictured below, position lululemon to capitalize on this emerging trend of trading leggings for jeans. lululemon's Lab Night Tights feature breathable mesh panels down the back to create a stylish pant that stands out. lululemon's Lab Night Tight. Source: lululemon athletica. The initial response for these new products is overwhelmingly positive. In fact, lulu's Lab Night Tights are already sold out online in many sizes , as are some of their other new products including their Full-On Luxtreme Prints, and Studio Pant styles. Jeans, on the other hand, are suffering from a lack of creative pizazz these days. Brian Sozzi, a retail analyst at Belus Capital Advisors calls the denim category boring, saying it offers "consumers generally nothing that they already don't have in their closet," according to Benzinga. 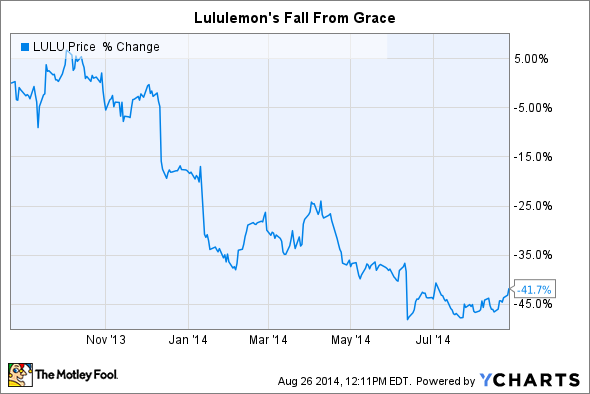 It seems lululemon has learned its lesson about resting on one's laurels. As you can see from the chart below, the company's stock took a beating over the past year after struggling with quality control issues, inventory problems, and a devastatingly outspoken founder. However, many things have changed this year, including new leadership at the top, with the entrance of Laurent Potdevin as lulu's new chief executive, and the official exit of lululemon's controversial founder, Chip Wilson. Wilson recently announced plans to sell half of his stake in the company to private-equity firm Advent International for $845 million. This is a big win for shareholders because it will allow lululemon to refocus its efforts on product development rather than mitigating internal conflicts between Wilson and the company's board of directors. But, more than this, lululemon's ability to turn things around depends largely on its ability to continue innovating. That's why the company's under-the-radar incubator for progressive ideas, Lululemon Lab, is so important. The Lululemon Lab is a research and development arm of the yoga apparel retailer located in Vancouver. Many of lululemon athletica's most popular products have come out of the lab, including its new Lab Night Tights we discussed earlier. Moreover, the lab's latest collection features everyday leisure wear rather than gym attire. This is important because it sets up lululemon to better capitalize on the emerging trend of swapping leggings for jeans. Lululemon Athletica is in a transitional period today. While the company appears to finally be on the right track, turning things around will take time. Having said that, industry trends and innovation are both on Lululemon's side now. This could make the yoga apparel retailer a smart long-term bet for patient investors with at least a three-year time horizon.